Throughout the Gallery and inside the Redlin Art Center's 108-seat theater, guests are invited to "meet the artist" via five videos about Terry Redlin. All video presentations are offered free of charge. In the Amphitheater, enjoy "The Legacy of Terry Redlin: A Lifetime of Memories". This new DVD production is a tribute to Terry. Inside this 108-seat theater, guests will hear Terry talk about his process and techniques and will see never before seen footage of Terry painting at his easel. With multiple showings daily, Redlin enthusiasts are invited to take in this special production honoring the man, his art, and the memories he painted. Admission is free. This series of eight paintings is a visual account of Terry Redlin’s distinctive world view. It flows from deep within the artist and represents one man's tribute to ideas and values that continue to resonate for so many Americans. This series of seven paintings took over nine years to complete. Recalling memories of his brother-in-law and dear friend, Terry Redlin’s paintings honor Servicemen and Servicewomen, Veterans, and the families who have paid the ultimate price for our freedom. In the Cabin, enjoy "A Conversation with Terry Redlin"
Terry Redlin gave the world a gift with his ability to capture memories so many of us share, from family traditions to life in rural America. Meet the man behind the artwork and share in the experiences that come to life on his canvas. In the Lower Level Gallery, sit and watch "An Artist's Profile". In this, "An Artist's Profile", you are invited to meet Terry Redlin. First released in the early days of Redlin's career, viewers will meet a younger Redlin enjoying his natural surroundings and sharing his feelings about life as a wildlife artist. 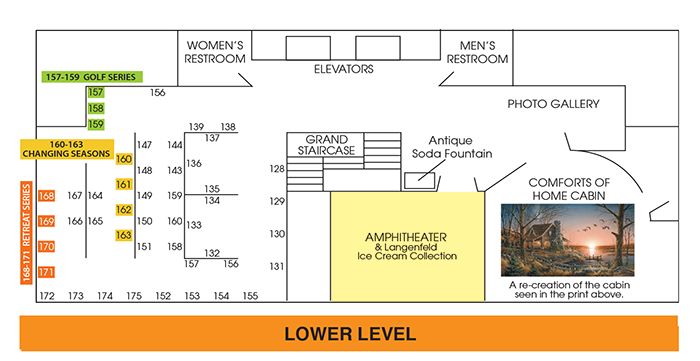 The Amphitheater is located on the lower level. The videos are free for any visitors to the Redlin Center, or you can purchase them in the Shop. There are multiple daily showings. Show times may vary from season to season. Visitors can request a showing at the front desk. You can also view the location by downloading our gallery map. Bring learning to life in your home or classroom. Terry himself shows his audience the technical demands and passion required to produce artwork cherished by many generations. 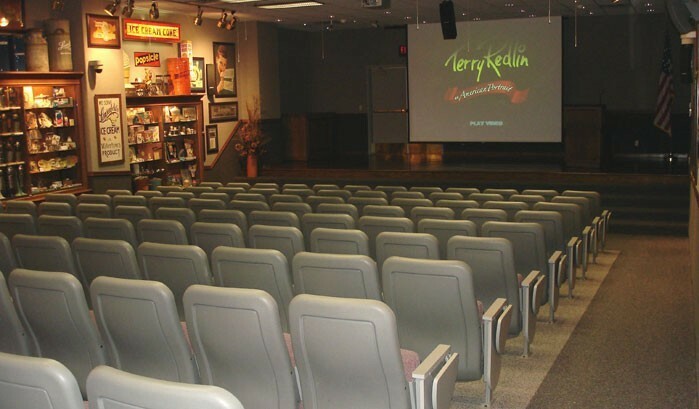 Visit the Redlin Gift Shop to purchase the Terry Redlin DVDs.